I reached the 50,000 word goal for National Novel Writing Month on Nov. 30th! I'm so excited! Now to actually finish the book. The last showing of The Princess & the Goblin play (based on the book by George MacDonald) was on Thursday evening at the Orem library. (Library director Gene Nelson, me, & Courtney. LDS author Angel Randall signed her book Snow Angels, illustrated by Brandon Dorman (who is also LDS), on Saturday at 3:30 PM at Deseret Book in Orem. 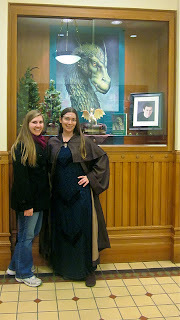 AND I won a first chapter critique from LDS author Michael Young! 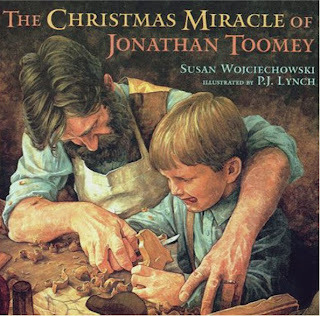 Wednesday & Thursday (Dec. 7th & 8th) Susan Wojciechowski, author of the book The Christmas Miracle of Jonathan Toomey, will be signing books from 6:15 - 7:15 PM at the Scera Playhouse in Orem before the Musical adaptation of the book begins (Susan will be signing both nights). The Musical will be showing until Dec. 17th. Click here for more information. Um, yes. I will be the first to sign up for the Courtney Lowe fan club. I'm so tempted to do it.